What better way to bring family together than with food? 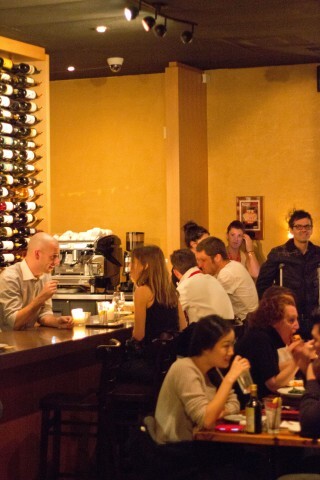 More specifically, what’s better than Italian food to bring the family together? It was my cousin’s birthday and my other cousins were back in town for a little visit. Perfect time for a family gathering over food! Growing up, all I had were my cousins. All of my aunts and uncles congregated within less than a mile away from each other. This meant that I grew up hanging out with my cousins almost daily. Some of my fondest memories as a child included my cousins. Now, we are all grown up. Double gulps from 7-11 turned into conversations over coffee, and ordering pizza for birthdays turned into dining out as a family, namely Osteria Mamma. To start, we had bread, butter and Frittura Mista. 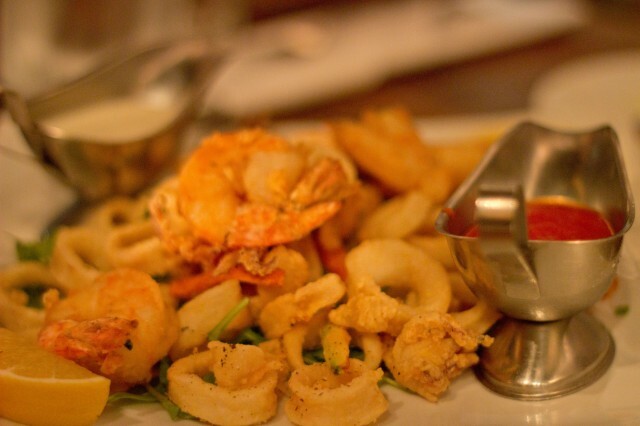 The frittuta mista had fried calamari, shrimp, zucchini, and carrots. The calamari was cooked nicely and not rubbery. The zucchini and carrots were good in this dish, but the moisture made the whole plate kind of soggy — not good for something that is fried. The shrimp though was nice and flavorful. It was a perfect starter for a large group like ours. The girlfriend and I shared the Pappardelle al Fumo. 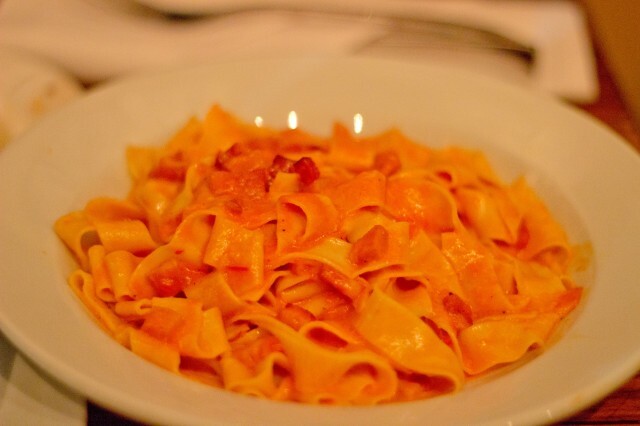 The thick Tagliatelle did a grreat job soaking up all that gorgeous pink sauce. The bits of pancetta added a nice smoky and salty element to the dish. Scamorza cheese and oregano topped this dish off to make it quite delicious. I might regret saying this, but the pancetta was too overpowering in this dish. A little more green herbs or less smoky bacon would have been a better fit. I had a taste of their lasagne and wasn’t really impressed. I know here in America, “Lasagna” ends with an “a”, but everyone else spells it lasagna. Anyways, the noodles were a bit soggy and I felt the dish needed to be seasoned a lot more. 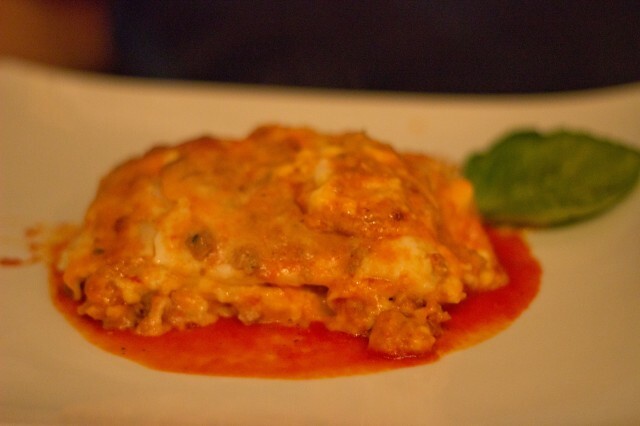 It may be that lasagne to me is a boring dish, but I really did not enjoy this one. To me, it needed to be more robust with meat sauce or herbs. Theirs was kind of plain with noodles, marinara, and cheese — simple and dull. The Tri Colori pasta dish was interesting to see. So colorful with red and green, it looked so festive. I had a taste — it was creamy and the noodles were so al dente. The texture, color and flavor was so pleasing. I also snagged a bite of the Gnocchi ai Porcini. Tossed in a light cream sauce, the porcini mushrooms in this was so full of earthy flavor. The pillowy gnocchi balls were so smooth and delicious. Not really a fan of gnocchi, I was hesitant about this dish. 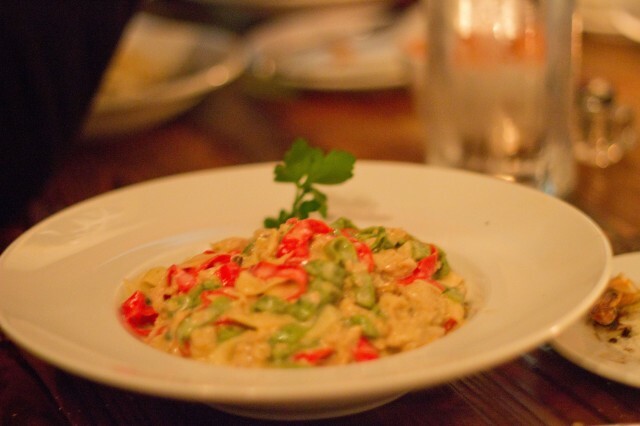 Osteria Mamma really knows how to make this dish delicious. My favorite dish of the night was the Reginette della Mamma. Reginette, basically a ripple edged tagliatelle, was a perfect pasta for any sauce. 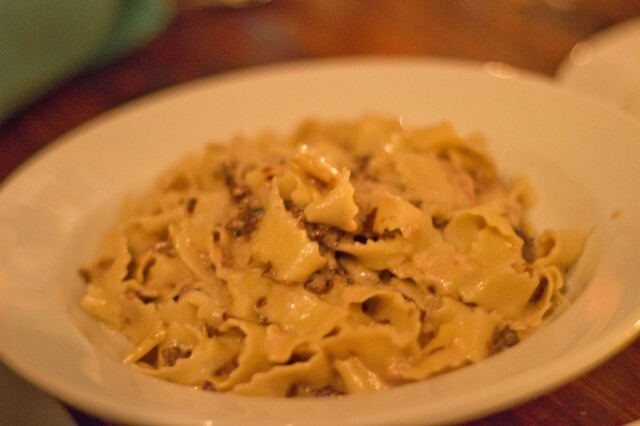 The way the cream sauce clung onto the ripples, the pasta had great flavor and mouth feel. With pieces of guanciale and sausage, this was a meaty dish without being too pronounced. The Treviso radicchio helped round out all the rich flavors in this pasta dish. Each bite was creamy and unctuous in flavor. This is what a good pasta dish should be, and is. Being a food blogger, my friends and family look to me for restaurants suggestions. 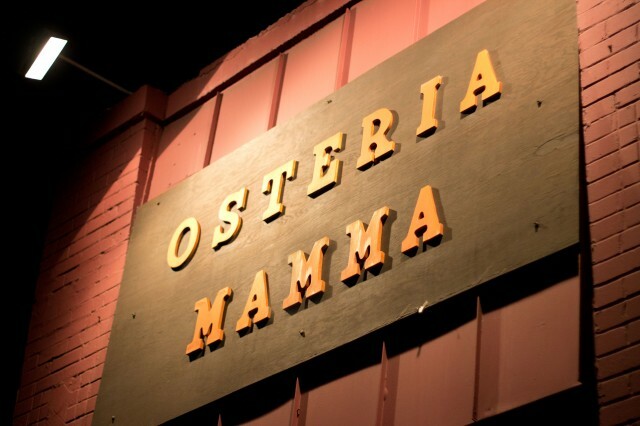 I figured, Osteria La Buca is a trendy spot, Osteria Mamma will be more of a down at home kind of experience — perfect for a family gathering. The night was filled with amazing pastas with great company. I always see massive gatherings of Italian families around the table. There, the grandmother makes her signature pasta dish and everyone eats together. That to me is the happiest moment in our lives. Though we didn’t have our grandmother in the kitchen, “Mamma” was our grandma for the night. We gathered, we talked, and ate. This will forever be in my memory as our family. Next post: Bacchanal Buffet (Caesar’s Palace) – Newest and Greatest?